When you have a baby, especially your first one, there is a tendency to be overprotective. One way this can be acted on is by keeping him or her safe and sound in the comfort of your home. 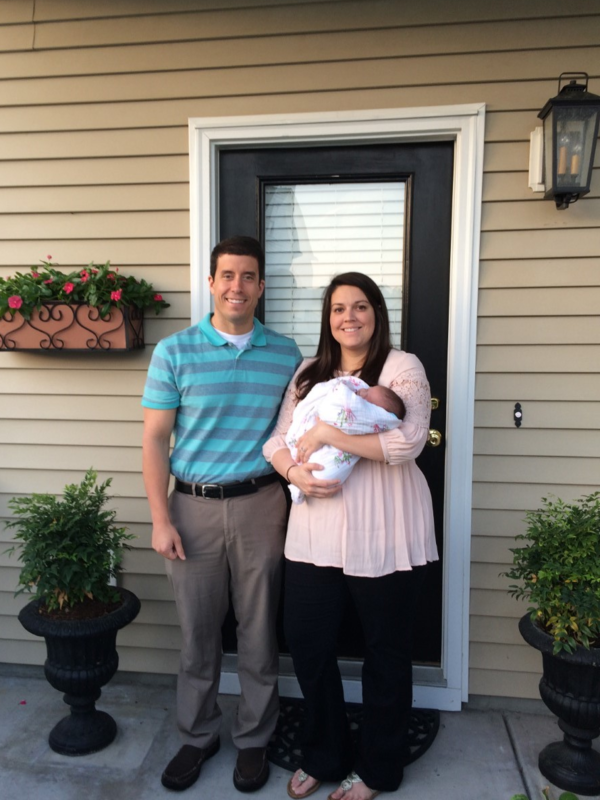 With Sloan, we kept her happy and nourished inside our Myrtle Beach home for the majority of her 6-week life. It is true, Sidney did take her on an errand here and there. We did take her off the premises for pediatrician appointments. Our baby did make regular trips to the house of family members. But it was never like we took her out on a “SLOAN MEETS THE WORLD” day-long tour. That changed yesterday. This past Saturday, our little family went on a series of “adventures” through the Grand Strand area. I put ourselves at the mercy of Myrtle Beach traffic (one of the greatest fears I have is something happening while we are driving with Sloan) as we embarked on a packed day for our baby daughter. We first went to the mall. If the trend of online shopping miraculously goes out of style in the next several years, it might be a place where Sloan spends time without us. We put her in the stroller and took her from one end of Coastal Grand Mall to the other. She did awesome. Sloan enjoyed cruising the Coastal Grand Mall. From the mall we headed to the Market Common, an impressive lifestyle area packed with restaurants, shops, condos, and entertainment options. There is also a giant park. Yesterday, the Myrtle Beach Dragon Boat Festival took place in this particular park. 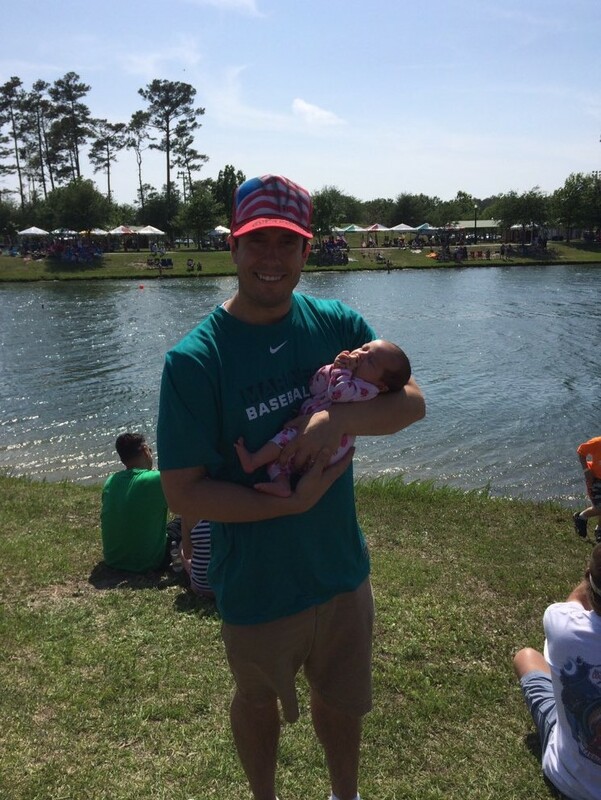 Sloan experienced her first ever fest as we introduced her to the throngs of people who had gathered on the 80 degree day for the popular event. I got some great practice maneuvering the stroller in a congested area, only managing to run over the foot of one stranger. We kept Sloan in a shaded area for most of the afternoon but we did move her up to a “front row seat” for the championship races. We made sure Sloan had a front row seat for the championship races at the Dragon Boat Festival in Myrtle Beach. Sloan wore her Sunday’s Best to mass at St. Andrew Catholic Church in Myrtle Beach. From St. Andrew, we headed off to a favorite restaurant of ours, Carolina Roadhouse. A large and noisy establishment (but incredibly delicious) we didn’t know exactly how Sloan would react. But she made us proud just like she did the entire day. We fed her a bottle while we waited for our food but for majority of the meal she peacefully sat in her car seat allowing her mommy and daddy to have some special time. After dinner, we troubled Sloan once more when we took her out of the car and up to a Redbox kiosk where she helped her parents pick out a movie. Her decision of “Collateral Beauty” was a good one. 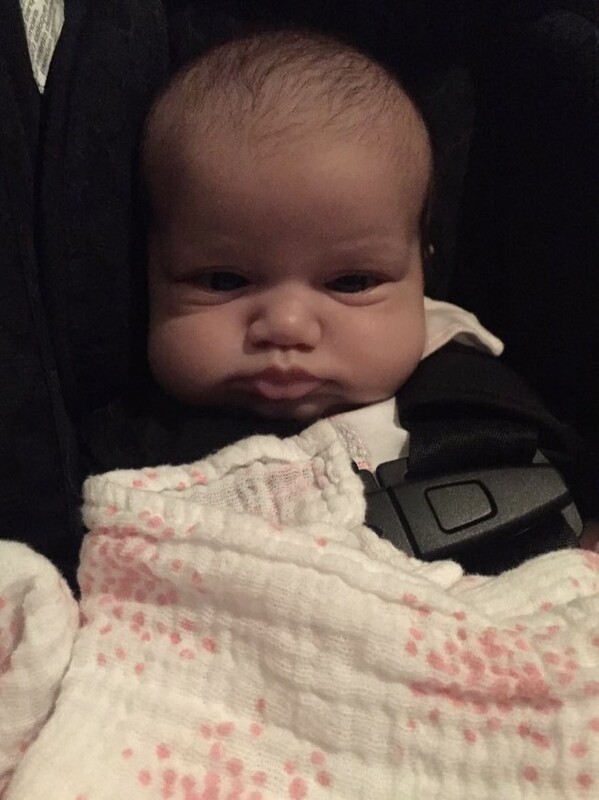 Sloan hung out peacefully in her car seat during dinner last night. Needless to say, Sloan slept GREAT last night. Even though stressful at times, it was so nice to get Sloan out in the community. She made everything so easy on her parents! Don’t Blink. Honoring My Student Worker – Yesterday evening, I was able to honor one of my student interns. Coastal Carolina University holds a yearly ceremony where graduating student-workers are honored. 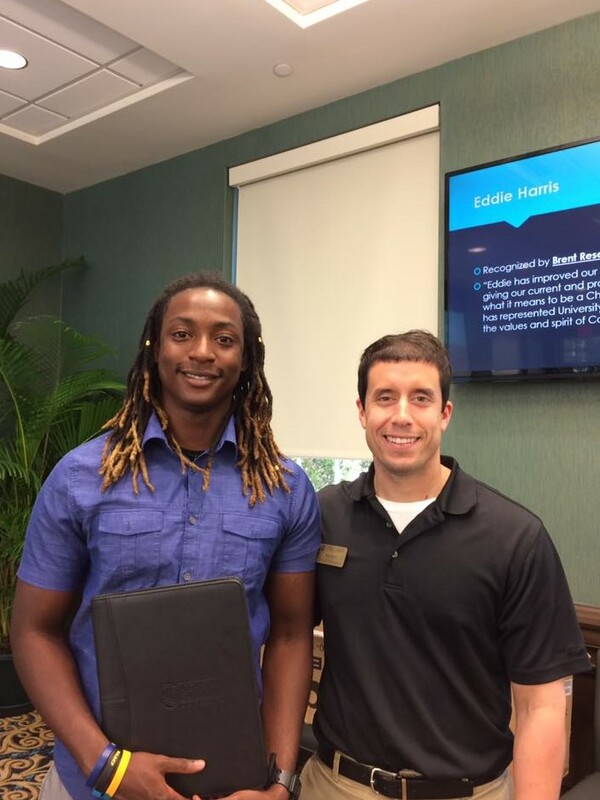 On Wednesday, Eddie (my intern) and I stood up in front of an audience of CCU employees and students as our Vice President for Student Affairs read what I wrote about him on the nomination application. Luckily, I will still have Eddie until fall commencement in December but it was a great opportunity for me to let him know that I really value the work he does. Eddie and I yesterday at the student-worker recognition ceremony. 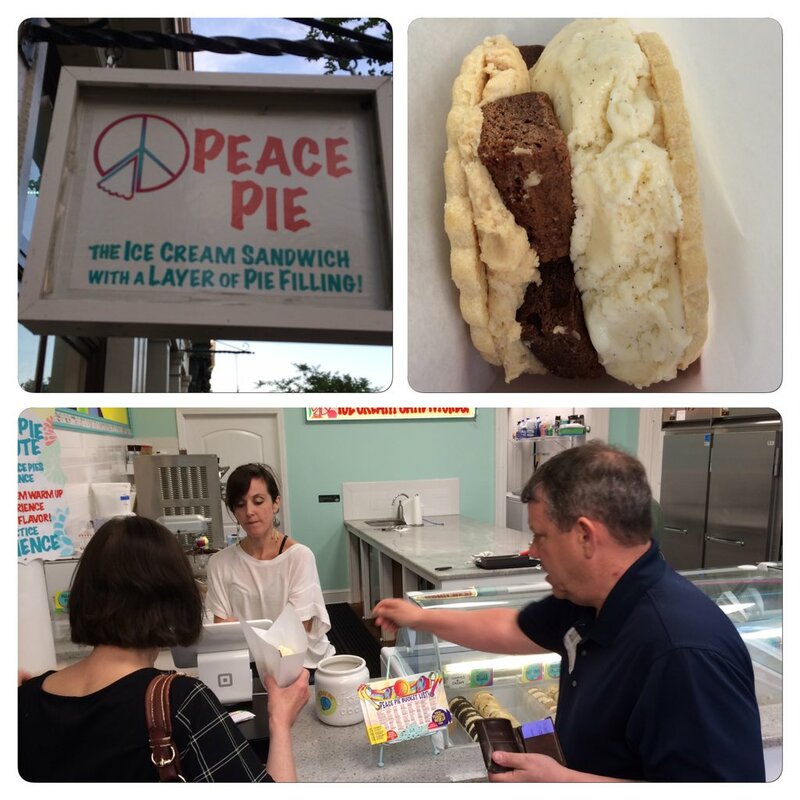 Peace Pie – This past weekend, I had the pleasure of eating the best ice cream sandwich ever. I have a long history with cookie ice cream sandwiches as my mom used to make them for my elementary school classmates on my birthday. My craving for them has not dwindled over the years. While exploring downtown Charleston, we came across a tiny storefront advertising Peace Pies. What is a Peace Pie? It is an ice cream sandwich with two fresh cookies, ice cream, AND pie filling. Yup, I said pie filling. My mom and I split a peanut butter brownie Peace Pie. It was $6 but it was also really good. If you are ever in Charleston, make sure to try a Peace Pie. 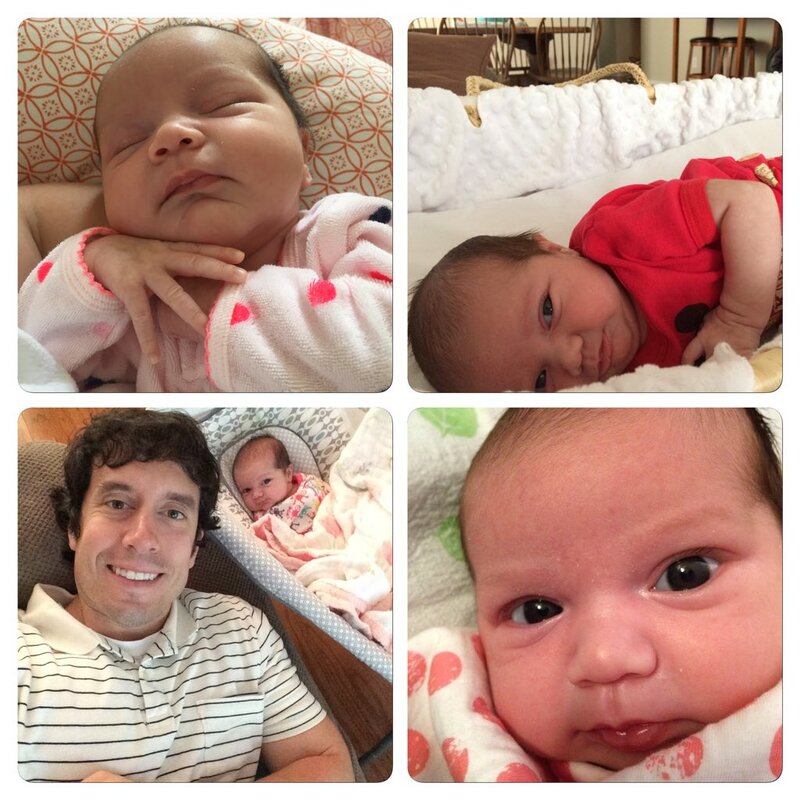 Sloan Photos – These might be some of the cutest Sloan photos yet. She will turn 6 weeks old tomorrow and it is amazing all the joy she brings our way. I might be a little biased, but isn’t she cute?? 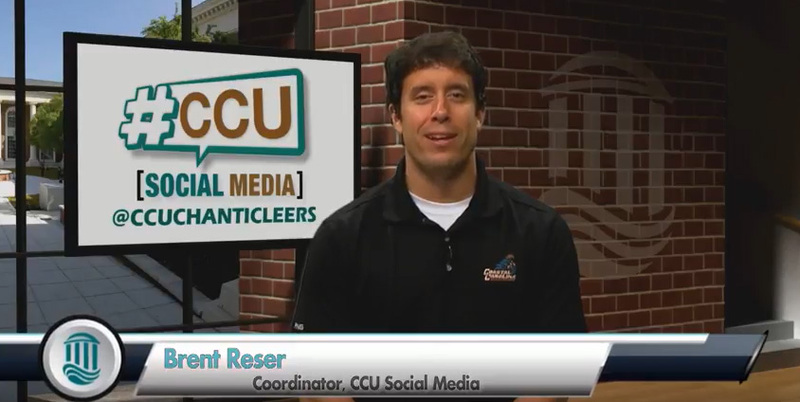 Latest Segment – This semester, I created a special Instagram account (@ccustudentview) at Coastal Carolina designed for students to show what a typical day at CCU is like for them. Each week, a new student takes over the @ccucstudentview account to add a fresh flair. What have students shared? Has it been successful? I answer both questions on my latest Social Circle segment. To watch me in front of the camera, just click here. If you dare, take time to watch my latest social media segment for our University news show. Peanut Butter and Banana Sandwich – What do you eat when you go to a famous Southern restaurant known for its fried chicken, fried porkchops, and macaroni and cheese? Well, a peanut butter and banana sandwich of course! 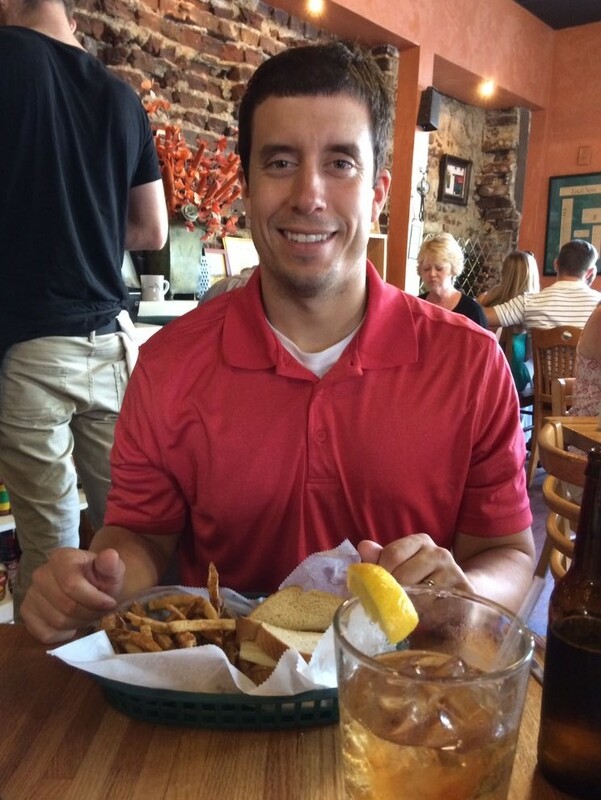 This past weekend I went with my parents and wife to Jestine’s, a popular eatery in Charleston. Sid and my mom both shot me a look of disgust when I ordered the sandwich but I had to go with what my tummy was telling me. It was delicious and I can’t wait until the next time arrives when I get to eat a peanut butter and banana sandwich. Although you can’t really see it, next to the French fries is my peanut butter and banana sandwich. Thank you for taking the time to read my latest blog post. Have a great rest of the month and I will touch base soon. Don’t Blink. 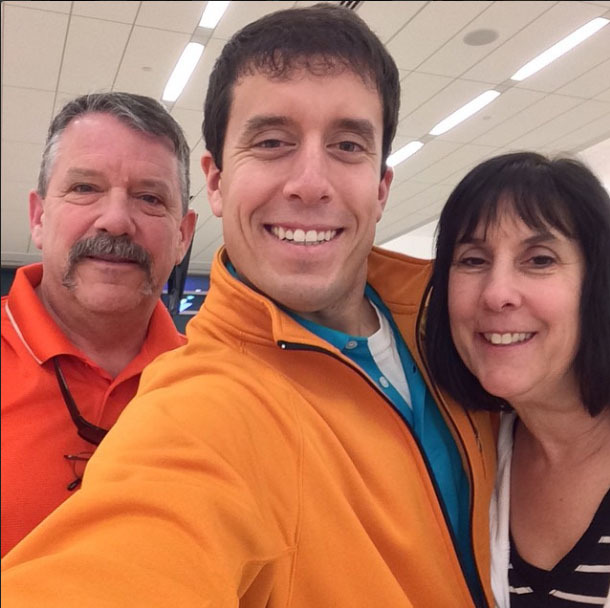 Last night, I briefly wrote about my parents’ recent trip to Myrtle Beach. I expressed how nice it was to have all of Sloan’s grandparents in one place and how it really hit home to me the crucial role each one played in her existence. I also addressed the best thing that came out of the journey my parents made to South Carolina: the love and care they bestowed on Sloan. In the same way that I experience a heartwarming feeling when I watch Sidney’s parents around Sloan, I felt the same with my folks. For several days I watched my mom and dad take such loving care of our daughter that it made my soul feel so happy. The second best thing that came out of my parents’ trip wasn’t the lawn care my dad did, the home cooked meals my mom made, or the baby supplies they bought us. Rather, it was something they said. Both my mom and dad told us that we are really good parents. About a month ago, I wrote about my fears regarding whether I would be an adequate parent (I already knew that Sid would be an amazing mom). To have two people who you respect and who are incredible parents themselves give such a ringing endorsement is beyond comforting. However, I won’t let it go to my head too much. I know I have a lot of work to do and many lessons to learn. But knowing that my parents observed Sidney and I in the same way that I observed them made me think that their comment wasn’t just an obligatory thing that moms and dads say to their kids. They really meant it. Of course good parenting isn’t something that one can lay claim to simply because others observed it in a single moment or over the span of several days or even over a time period of many years. Rather, it is something that you have to prove day in and day out. I plan to use the encouragement of my parents as motivation to always do my best for Sloan and never take a day off. With the amazing partner I already have in this “parenting game” I feel confident that if I do my part we will make good on the words of my mom and dad. Don’t Blink. Earlier this morning my parents said goodbye to Sloan and started their trek back out west. I believe as I write this, they are on a layover in Colorado. Can’t thank my parents enough for all they did for Sloan over the past several days. This blog or words themselves won’t do justice to the gratitude I have toward my mom and dad for all they did for us over the past six days so I won’t even try. All I will say is this: they are incredible and selfless grandparents who helped us out incredibly during their time here. The many things they did and the extent they went to do them will not soon be forgotten. My mom’s eyes express nothing short of true love. She grew very attached to Sloan. 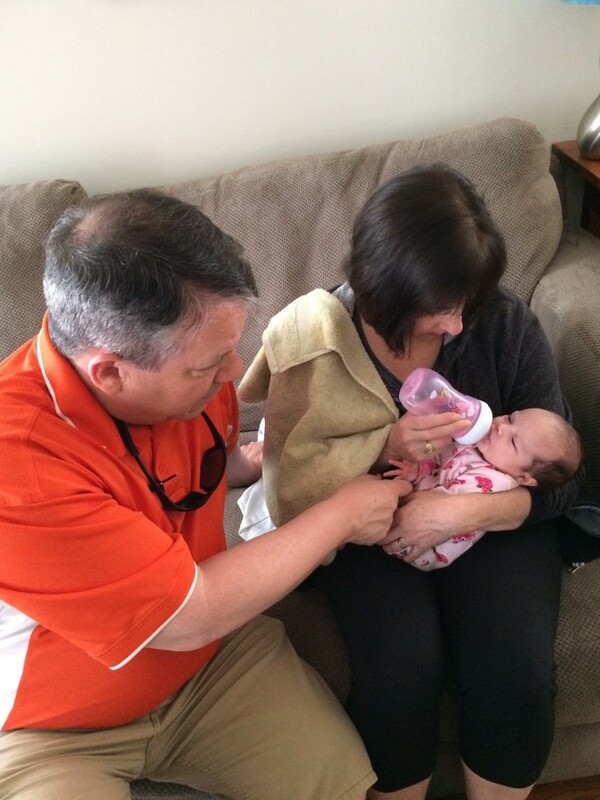 Speaking of awesome grandparents, Sloan has her Gammy and Dada (Sidney’s parents) as well. Over the past week, it was nice to have our daughter’s “western” and “southern” grandparents in the same place. During my parents’ trip, there was ample opportunity for the two couples to interact. When I saw them together, I couldn’t help but think the vitally important role each grandparent played in the creation of Sloan. If it wasn’t for my mom or if it wasn’t for Sidney’s dad, the light of our world wouldn’t exist. If it wasn’t for Sidney’s mom or for my dad, that special baby girl with the calm demeanor and sweetest little smile would not be around to make Sid and I the luckiest parents ever. It became plainly obvious to me that our parents played just as much of a role in creating Sloan as we did. Sloan enjoyed meeting her papa. Mom and dad, thank you SO much for everything. We are so glad you got to meet Sloan and so thankful you had such an impact on her. We love you. Don’t Blink. Tomorrow, something Sloan has eagerly anticipated her whole life (which is one month) will become reality. 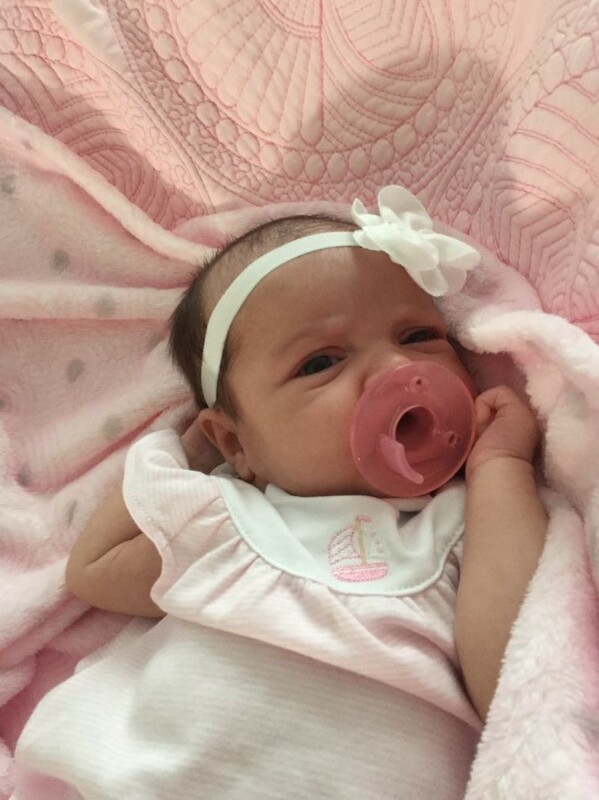 At around 11 a.m. on Wednesday, she will meet her West Coast grandparents. Sloan isn’t the only one excited. My parents will embark on a typical Washington state to South Carolina airline itinerary starting tonight. Hopping on a place this evening at around 8 p.m., they will crisscross the country via different connections before landing in Myrtle Beach around 10:23 a.m. tomorrow. Any symptoms of jet lag will most likely be erased once they hold Sloan for the first time. My parents will arrive in Myrtle Beach tomorrow. I have never seen my mom so excited for a trip. 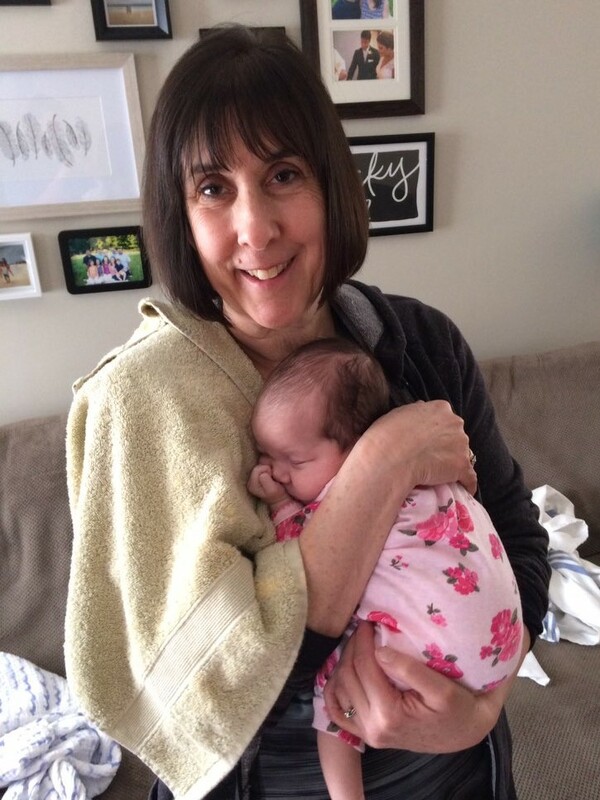 Since Sloan was born, she has sent daily text messages expressing how she can’t wait to finally come face to face with her granddaughter. Observing how my dad’s eyes water up the second he sees Sloan on FaceTime, I am going to guess he is looking forward to his time in Myrtle Beach as well. My parents booked their travel with the original April 7 due date in mind. Of course by now most of you know that Sloan came three weeks early. My mom and dad were able to contain their pure joy and exuberance by not adjusting their original travel plans. As it turns out, their discipline will pay off. Sidney’s mom had to sadly return to work today, ending a selfless run where she helped out so much around the house and with Sloan. But her return to her position comes just one day before my parents arrival. That means Sidney, the baby, and myself won’t be without assistance, homemade meals, and solid parental experience for long. Giving us strict instructions not to worry about entertaining them or feeding them, my mom is making it clear that she doesn’t want us to feel any pressure with their arrival. Rather, just like my mother-in-law, she wants to do anything she can to lessen the load on us. We will be lucky to have them with us through next Tuesday. Prayers for my parents that they may have safe travels through tonight and tomorrow. I am so excited to show them what Sidney and I created! Don’t Blink. I hope everyone had a wonderful Easter. In the days leading up to yesterday’s holiday, I heard on the radio about a seasonal food dish that was making national news. A pizza place in Boston was offering a Peepza, or, in other words, a pizza topped with melted Peeps. This does not meet the classification of a dessert pizza because it has a base of tomato sauce and is topped with mozzarella cheese, making it fit more in line with the requirements of a traditional pizza. It didn’t appeal to me. Pineapple – I get so tired of the “I don’t want fruit on my pizza” B.S. In my opinion, pineapple is as much a pizza topping as pepperoni. I mean come on, Canadian bacon and pineapple is one of the most popular pizza combinations. But people still get really sketched out about it. I grew up eating plain pineapple pizza (sans Canadian bacon) so I embraced the topping early. When I was between the ages of 7-13, my favorite pizza combo was sausage and pineapple. Yep, the person taking the order would always have to confirm that. Again though, pineapple can stand alone on a pizza just fine and I see nothing wrong with it. Mac & Cheese – If you ever visit CiCi’s Pizza, a national all-you-can-eat pizza chain, this option is always out on the buffet. Sure, noodles do look a little funny on pizza but how can you go wrong combining two of the best foods out there? Although the mac and cheese pizza might be targeted more for a younger audience, I have no shame. In my opinion, it is delicious. Fritos – I have written about the infamous Papa John’s Fritos chili pizza before but for obvious reasons I must bring it up for this blog post. As long as you eat a pizza topped with Fritos right after it comes out of the oven it is very tasty. Put it in the refrigerator or eat it the next day and you will be in trouble, but a pie topped with fresh Fritos won’t leave you disappointed. The crunch seems natural enough and it provides a unique taste. 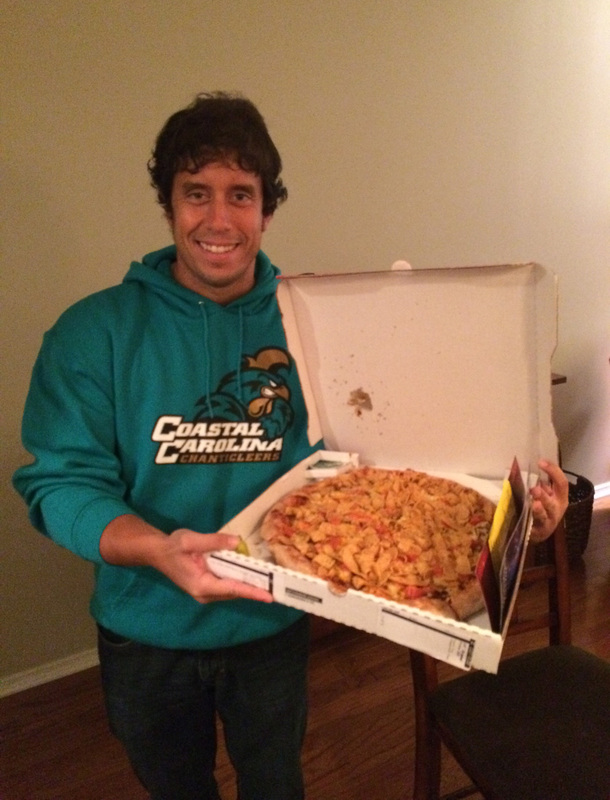 Me holding the Fritos Chili Pizza from Papa John’s. Peanuts – Maybe out of all the toppings on this list, I like nothing more than chopped peanuts on my pizza. Popular on Thai style pies, there is no better nut to put on your pizza. You do get the crunch just like you do with the Fritos but I think peanuts pack a flavor that tastes a little exotic, especially if it is paired with the right sauce. But when it all comes down to it, sauce be damned, I will happily take chopped peanuts on a traditional red sauce pizza. Corn – When you think of vegetables on your pizza, your mind probably conjures up peppers, tomatoes, and onions…not corn. However, thanks to the artisan build-your-own personal pizza craze, the options for other vegetable toppings has opened up. To me, corn is just a good fit on pizza. Each kernel is small and easily rests on the surface, it adds some color to the presentation, and it provides good texture. When I visit MOD Pizza, I am getting a healthy dose of corn each time. So although I really enjoy the five above toppings, I have never had a pineapple-mac & cheese-Fritos-peanuts-corn pizza before. Whipping that up would be quite a blog post, don’t you agree? Oh, man. Do you have any eclectic pizza topping choices? Let me know. Don’t Blink. Today is a holiday that is very special to me. You see, I enjoy Easter just as much as I do Christmas. And, just like Christmas, today’s holiday can sometimes get lost in the commercialism and political correctness of our society. We try our best not to fall into this trap because Easter comes after the Lenten season and at the end of Holy Week, important periods on the religious calendar that help us prepare for today’s important feast. However, I would be dishonest if I said chocolate eggs, pastel colors, and fresh ham don’t occasionally cloud my focus. But I am doing my best today to remember and celebrate what this holiday is about, primarily that our faith is not baseless. Today Jesus Christ rose from the dead and gave justification and hope to the billions of people on this planet. The Resurrection is about faith, love, and redemption; it is also about new life. The newness of life brought into our family recently helped me to understand the newness of life that we celebrate today on Easter. As you can imagine, the “new life” part of the equation especially resonates with me this year. When Jesus rose from the tomb, he gave us all the chance to start new, both in this life and in the next. It is just like when a baby is born. 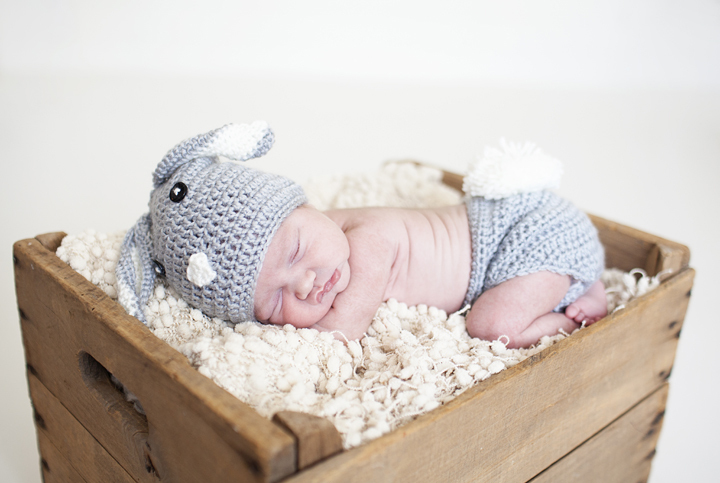 There is nothing more innocent nor special than a newborn. A whole life awaits them, full of opportunities and possibilities. You can’t “start new” much more than that. They say that becoming a parent increases your faith in God and I can now attest to that. When I look at Sloan I can see that pureness, I can see that innocence, I can see that vulnerability that makes her so perfect and redeemable. Happy Easter! Sloan didn’t even need to wear the bunny outfit to teach me more about this special holiday. These beautiful characteristics of Sloan paint a clearer picture for me of what new life looks like not just from the obvious standpoint of a brand new baby but from the bigger vantage point of what all of us aspire to. Because God raised his Son from the dead, we ourselves become more pure and innocent, just like a newborn. It is amazing the secrets that become available inside your heart once you have a baby. Sloan has helped me to understand and love Easter even more. Don’t Blink. Good evening! I hope your Holy Week has gone well and that you are making the necessary preparations for a joyous Easter celebration. Here we go with my latest Thursday Rundown. Thirteen Reasons Why – The hottest series out on Netflix right now is Thirteen Reasons Why. The program’s narrator, a high school girl, details the 13 reasons that drove her to take her own life over the course of 13 episodes. Sidney and I watched the entire series in about five days and we couldn’t turn our eyes away, even through the tough moments. The show addresses timely topics and introduces an engaging cast. It may or may not be for you, but I do recommend watching the first couple episodes. 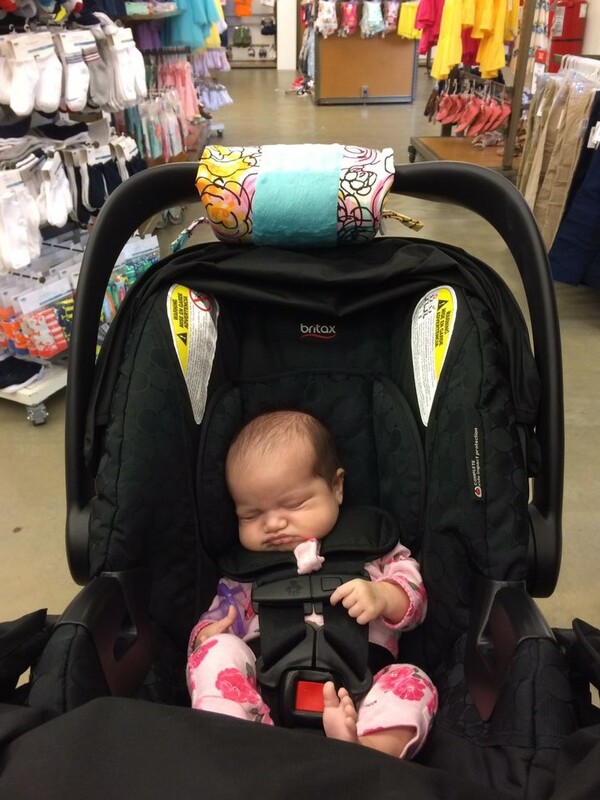 Taking Sloan to Work – Earlier this week, I got to show off my daughter at work! Sidney brought Sloan to campus so I could parade her around our University Communication offices. Wearing her own little Chanticleer outfit, Sloan got to meet my co-workers. The people I work with showed great interest throughout Sidney’s pregnancy so it was nice to be able to share with them the grand result. Even though Sloan slept through all the excitement, I think she enjoyed the little outing. 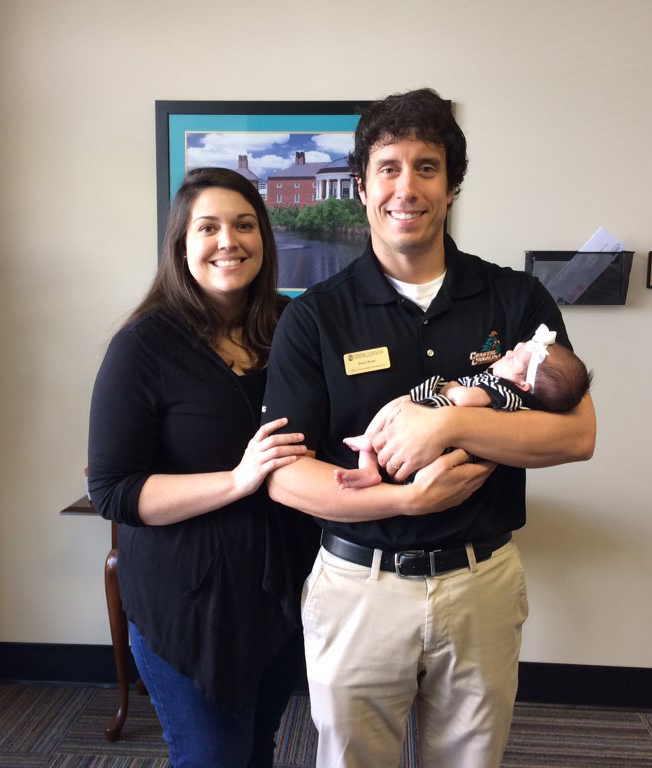 Sidney brought Sloan to the office earlier this week so she could meet the people I work with. 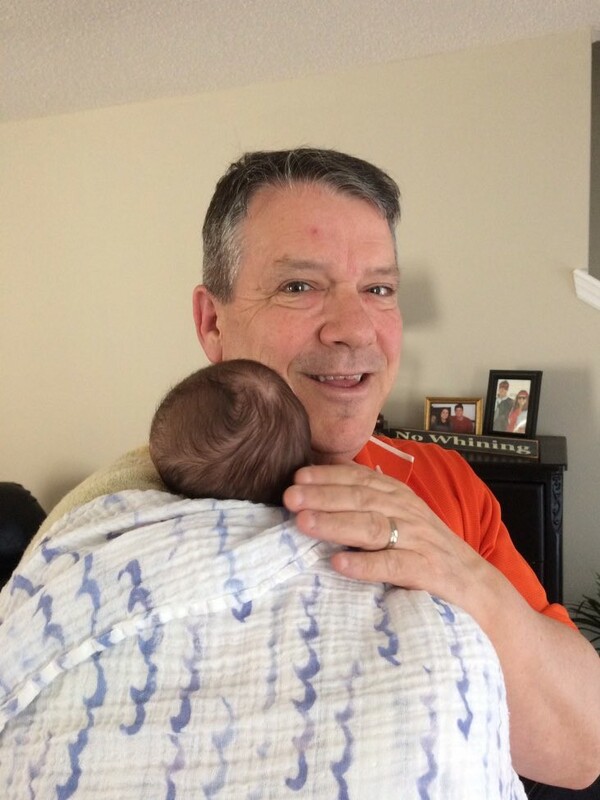 Meal Change – In Tuesday’s blog post, I wrote that I am making life changes so I can devote more time to my daughter. In that particular post I announced that my blogging schedule would be cut back a bit. Today I want to share another change with you. 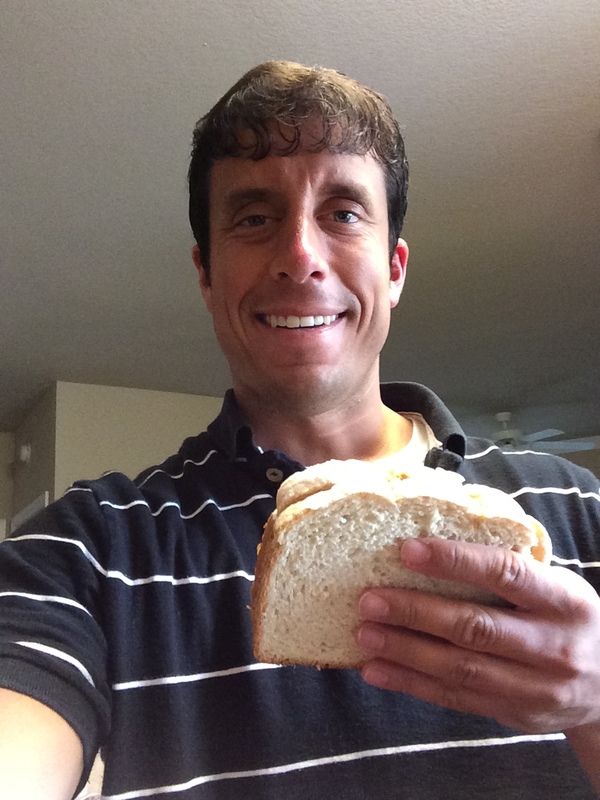 My longstanding tradition of eating a peanut butter sandwich for lunch is now over…kind of. I would normally eat a half of a peanut butter sandwich for breakfast and a regular peanut butter sandwich for lunch. However, it took time to prepare the sandwiches. To eliminate those minutes spent slapping PB on bread, I have converted to Uncrustables. I now eat one Uncrustable for breakfast and two Uncrustables for lunch. They are quite good. I used to eat half of a peanut butter sandwich for breakfast and a full peanut butter sandwich for lunch every single day. In April of 2017 I switched to eating one Uncrustable for breakfast and two Uncrustables for lunch. 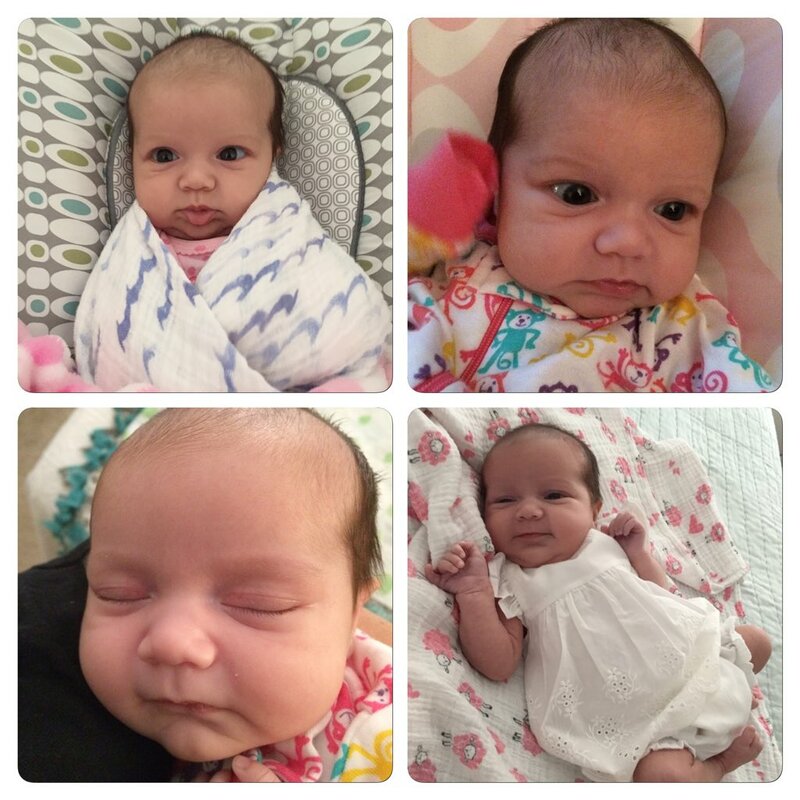 Here are the latest photos of our sweet Sloan. That Moment I Attended a Mike & Mike Broadcast – Two years ago on this date, I covered the Monday After the Masters event put on by Darius Rucker here in Myrtle Beach. 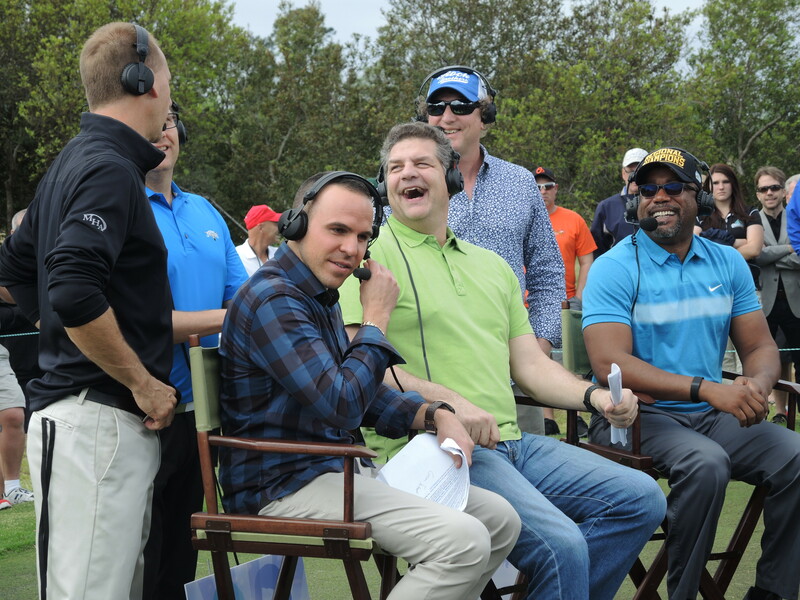 It was a day filled with celebrities and golf but my favorite part of the event was watching Mike & Mike in person. The show was broadcast live from the event and I got to see firsthand how the country’s most popular sports talk radio show is produced. Although Mike Greenberg was out that day (Ryan Rucco filled in for him) I got to watch Mike Golic do his thing. It was a blast! This was one of my favorite photos I took two years ago. Golic and Ruocco interview Darius Rucker and his band. I want to wish all of my readers a happy Easter. Rejoice and be glad for He is risen! Don’t Blink. I have alluded to this a couple times in recent blog posts but I wanted to address it in an official manner. Almost four weeks ago, I was given the biggest blessing of my life when Sloan was born. In just under a month since that beautiful day, I have enjoyed every minute of being a dad. Although I knew going in that my time commitments would be dramatically altered once she was born, the last 26 days have confirmed it. For the past 4-5 years, I have been a full-time blogger. I have made it a point to blog at least five times a week. Giving Don’t Blink priority over other activities was cool when my responsibilities were less but things change when you are suddenly in charge of another human being. I won’t delve into the time that is demanded when you are writing and formatting blog posts on a consistent basis because I have done that before. However, I can tell you in general terms that it is a lot. Now don’t think for one second that I am throwing in the towel on Don’t Blink. Hardly. I still plan to post 2-3 times per week. There might even be instances where I do find the time (in the wee hours of the morning or on Sundays) to publish the number of posts per week that you have come to expect over the years. But those instances will be the exception, not the rule. There is a piece of me that feels like I am letting my dedicated readers down but I hope everyone can understand. As for my condensed schedule, I plan to still publish a Sunday blog post each week. The Thursday Rundown might morph into something I do every other week. While the Rundown is an easy post for me to write, I don’t want each week to consist of a regular blog post and then just a Thursday Rundown blog post. I feel I owe more to my readers than that. So, with that said, I hope to offer at least two well-written, non-rundown posts per week. Yes, this means you might see a non-rundown formatted post on occasional Thursdays. I appreciate all the support given to me by my readers over the years. I still look forward to your enthusiasm and feedback. Remember, this blog is not going anywhere – the posting frequency will just be tweaked a bit. Don’t Blink. Not a terribly long Sunday blog post today, which is probably a good thing. Since giving birth to our baby girl, she has strategically taken time away from my normal blogging pattern so I can no longer bore you with posts that go on past 700 words. Besides impacting Don’t Blink, she has also evolved my thinking in a few other ways. How about I just give you five of them? Since having Sloan, my thinking has changed. 1. The World is a Scary Place – When I was a kid and adults would tell me “the world is a scary place” and that they “worry about the environment their kids will grow up in” I didn’t really get it. However, now I do; at least just a little bit. This past week with the chemical attack in Syria and President Trump’s cruise missile response, I felt some fear for Sloan. She is growing up in an age where all it takes is some noxious gas being discretely released to kill thousands and an age where our country seems to be picking up more enemies each day. 2. All Planning Relies on My Baby – Of course I knew that our lives would change dramatically once Sloan was born but now it is just so much more real. Since she arrived in this world, whenever I make a plan, whether it be short term or long term, I automatically think of Sloan’s schedule first before I think of mine. If we are planning something for three months from now, I calculate how old that will make Sloan and how she will react to whatever we will be doing or wherever we will be going. 3. Getting Through the Night – I used to have bad sleeping habits but then Sidney really helped me develop a better schedule. Well, so much for that. I am no longer focusing on getting seven hours of sleep a night but rather focusing on planning out the three times during the evening hours when we will be feeding Sloan. however, although I really grew to enjoy getting an adequate amount of sleep each night, I don’t mind staying up with Sloan because it is a great way to bond. 4. The Worry – My mom tells me that now I have a daughter of my own, I will never stop worrying again. So true. Even at her ripe old age of three weeks, I have plenty of paranoia. Is she eating enough? Why did she make that noise? Is she uncomfortable? Am I holding her right? Will other drivers on the road make good decisions while she is in our car? Are we aiding her development? etc. etc. etc. I constantly tell myself to just relax, but the worry is always in the back of my head. 5. Am I Doing a Good Job? – I have great parents. Sidney has great parents. I feel the pressure to follow in their footsteps and be a great parent as well. But I have found myself asking this over the past three weeks: Have I done as much as mom and dad did when they had me? 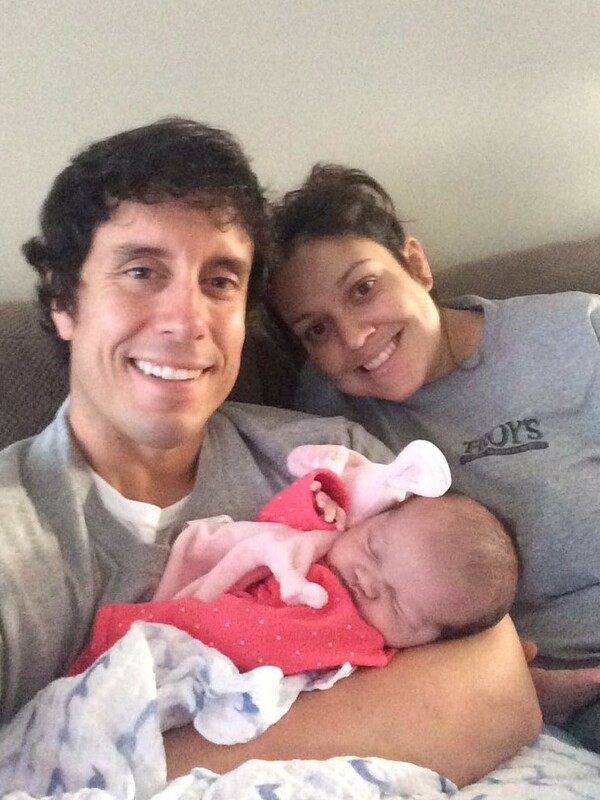 In Sloan’s first 23 days of life, have I done as much for her as my parents did for me? I am constantly wondering if I am giving Sloan what she needs and deserves. So now that you know what is on my mind, it is time that I sign off and go back to my daughter. Oh yeah, I might watch a little bit of golf today too. Don’t Blink.